WarehouseFoil™ radiant barrier insulation is a great way to help keep metal structures from overheating inside in summer and from freezing inside during winter. The use of the radiant barrier on the walls and under the roof of these structures reflect RADIANT HEAT (this is the heat you feel!). Air ventilation helps, but the when you are standing under a 150ºF metal roof, you can feel the radiant heat being emitted. To stop that heat gain, simply get a piece of WarehouseFoil™ between you and the hot roof and feel the immediate difference. Radiant barrier reflect about 97% of radiant heat – that is a big difference! 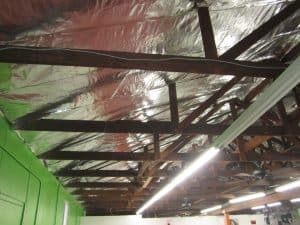 While there are many options for insulating a metal building, the most effective option in a non-conditioned (meaning you are not cooling/heating it with forced air) building is to use radiant barrier. The radiant barrier drastically reduces the heat transfer from any and all sides it is placed on. With proper venting and good radiant barrier foil coverage, it’s not unreasonable to expect to get your interior building close to ambient temperature. Check out the video above done by one of our customers for a metal building with wood framing. Easy installation. Just staple the foil to the wood framing (details below). The ideal install method is to have an AIRSPACE between the metal building and the WarehouseFoil™. Partial coverage works! Do one area of the building, you will notice the difference in comfort. Then continue to the rest of the building. Cost effective. Our foil is less than other products with bubbles and foam, but equally as effective & a DIY option. Wood frame metal buildings are probably the easiest of any buildings to install WarehouseFoil™. The framing is typically 2×4 and the roofs are usually truss built. For the roofs, the most common install method is to run the 48″ Wide WarehouseFoil™ ACROSS the bottom of the rafters or trusses. In a horizontal left/right method. Simple start at the bottom staple up one run of foil and continue up to the top. Or, if your trusses are on 24″ centers, you can run the 26″ Wide WarehouseFoil™ Vertically Up/Down between each truss. Either way, you will want to leave a few inch gap at the top and the bottom for air to flow freely though the building. Remember we are NOT trying to stop airflow (we want good airflow) we are simply tying to break the path of the radiant heat coming off the metal roof. We tell customers everyday not to overthink things because really, it is very simple. The metal in these buildings is getting over 150ºF degrees and it is radiating heat across the building. All you want to do is break this path and reflect the heat back toward the source. There are many different ways to do this, and you might have to improvise somewhat for your particular building, but your ultimate goal is the same: cover as much as you can. 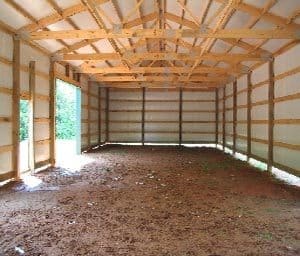 In metal buildings with wood framing, the walls are typically supported by horizontal 2″x4″ supports that the metal is attached to. Simply install the WarehouseFoil™ to the INSIDE of this wood framing. This will provide an airspace of 1.5″ between the foil and the metal. You can either run the foil horizontally or vertically. It does not matter, whatever is easiest. Most metal panels are ribbed and will allow air to naturally flow between the wood and the metal. Leave a small gap of a couple inches at the floor. This will provide an “intake” vent for air to come up between the foil and the metal. If you want a bright white interior finish, consider using our newest product: Single Sided WarehouseFoil with a White Vinyl side (it’s available in both a perforated version and a solid vapor barrier version). If you need ANY advice or have questions, please contact us anytime. Send Pictures or even a video! This really helps us understand your building better and helps us recommend the best options for your situation.